At the Killino Firm, we know birth trauma. We recognize that serious birth trauma can have lasting effects including permanent disabilities and physical disfigurement that may require life-long care and expensive treatment. We also recognize the emotional pain and suffering associated with such injuries. As a result, we are devoted to helping parents and families of infants who suffer injuries during the birthing process recover any compensation they are entitled to. Because the birth process is full of compressions, contractions, torques and traction, it is not uncommon for infants to sustain minor trauma when outside complications arise. In many cases, those outside complications cannot be prevented. Large babies, for instance, have an increased risk of birth trauma than others. However, in the event that a mistake made by a doctor, nurse, or another healthcare provider, has something to do with the injury, the infant and family will qualify to seek justice and recover compensation for their pain and suffering. At the Killino Firm, we fight zealously on behalf of injured infants and their families and will make sure that the responsible parties are held accountable. 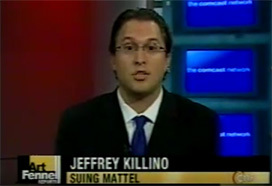 From CNN to ABC and around the world, the Killino Firm has been recognized in the news for its commitment to safety. We believe in helping the injured and their families, and work tirelessly to promote safety for every American and his or her family. Please feel free to view the Killino Firm in the media. While we have recovered millions of dollars for persons and families affected by catastrophic injuries and events, our greatest accomplishment is promoting safety on a national level. Birth trauma is defined as injuries resulting from mechanical forces such as traction or compression during the birthing process. While statistics show that birth trauma accounts for less than 2 percent of neonatal and stillbirths in the U.S., severe trauma can dramatically affect a family’s life forever. No matter how severe your child’s birth injuries, at the Killino Firm, we believe that all responsible doctors and nurses should be held accountable for their mistakes and negligence. We are committed to fighting tirelessly on behalf of injured infants and their parents. We work closely with a team of medical experts who will help conduct a complete analysis of the birth reports to help us determine the cause of injury. In the event that negligence was displayed, we are committed to fighting exhaustedly to ensure you and your child receive the maximum compensation you are entitled to. If your child suffered an injury during the delivery process and you suspect negligence may have been displayed, you are entitled to seek and recover compensation for your losses. To schedule a free, private consultation with one of our attorneys who cares about your circumstances, please contact the Killino Firm today. We will listen to the details of your individual circumstances, thoroughly evaluate your claim, and fight aggressively to ensure you obtain the full amount of compensation you need and deserve. We will respond promptly to your inquiry so that you can experience The Killino Firm Difference.